Mawes, born in Wales sometime in the 6th century, was a hermit in an area of Cornwall now known as St Mawes. 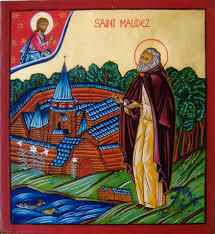 He emigrated to Brittany where he founded a monastery on the island of Maudez; he had to drive out the snakes and vermin in order to build there. he worked with St Budoc and St Tudwal to found the monastery. There are more than 60 churches in the region dedicated to him. He is patron against snake bites and headaches and is often represented as a bishop or as a schoolmaster.